Monday–Friday – 10:00 a.m.–6:00 p.m.
Saturday – 10:00 a.m.–4:00 p.m. Season tickets to the 18/19 season are not available at this time. Please sign up for eNotes, our free eNewsletter, for future sales information. Neither Dallas Summer Musicals nor Ticketmaster can guarantee the authenticity of tickets purchased from any other reseller (such as brokers or individuals). Currently there are some scalpers, also known as “second party vendors,” selling tickets online at a rate more than double the standard price. Their websites look official and offer DSM tickets, however tickets purchased via those sites could be fraudulent, meaning tickets bought through these means may not be valid and you would be refused admission. Dallas Summer Musicals urges customers to purchase tickets directly through our website at www.DallasSummerMusicals.org, at the Box Office, 909 1st Avenue, Dallas, TX 75210 or by calling 1-800-745-3000 (Monday-Saturday: 10 AM – 6 PM, Sunday: 10 AM – 4 PM). *DALLAS SUMMER MUSICALS AND BROADWAY ACROSS AMERICA DO NOT SUPPORT THE RESELLING OF OUR TICKETS AT A PRICE ABOVE THE PRINTED FACE VALUE. Your use of this website and your purchase of tickets through our Group Sales facilities constitutes your acceptance of the following terms and conditions without limitation, qualification or change, and you consent to be bound by such terms and conditions. You represent and warrant that the tickets you receive will not be resold to individuals above the face value, unless you meet all of the following conditions: (i) you are a tour operator, authorized concierge service company, travel agent or other authorized wholesale travel industry partner of the Company that (ii) packages the tickets with hotel reservations, transportation arrangements or other travel amenities, and (iii) such packages include substantial value to each purchaser thereof above and beyond the rights and access provided by the ticket alone. Dallas Summer Musicals and Broadway Across America each reserves the right to refuse service to any person or entity that resells any group sales tickets for profit in the secondary marketplace. If Dallas Summer Musicals or Broadway Across America discovers that tickets sold as part of a group order have been resold individually at a profit or otherwise in violation of the conditions described above, each entity reserves the right to revoke your group benefits at any time, including but not limited to rights to purchase tickets, group discounts, payment plans, complimentary ticket policies and priority seating privileges, and subject to applicable law, we may also revoke Group Sales tickets. 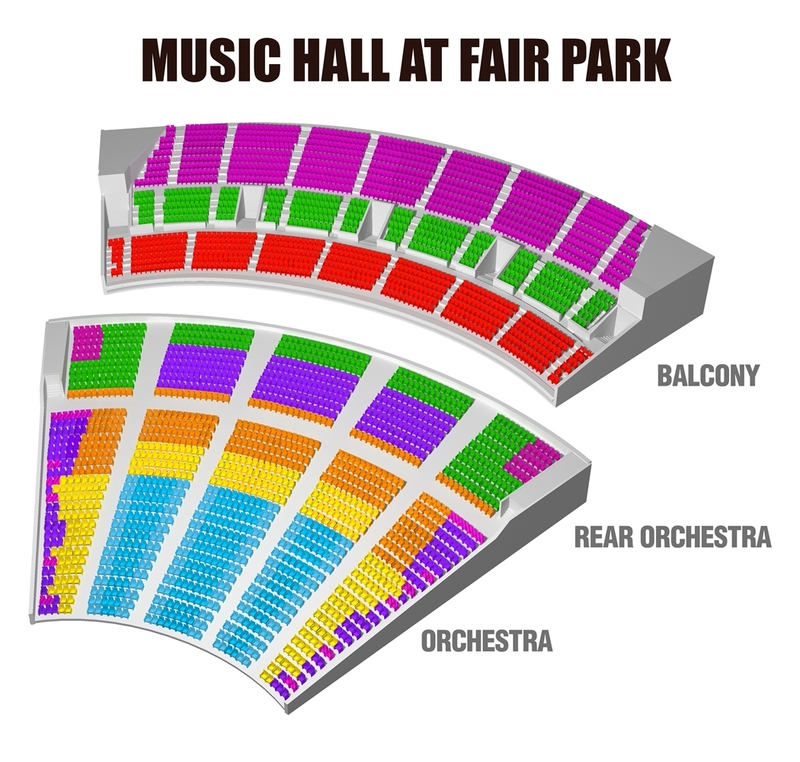 Producers’ Circle at the Music Hall at Fair Park is the best seats in the house – Orchestra Sections C, D, and E; Rows A-P.
For more information about Producers’ Circle, please contact the Development Department at 214-426-6333 or email us. A Dallas Summer Musicals Gift Certificate is a unique gift, perfect for almost anyone. Whether you are looking to buy for the person who has everything, or shopping for that special someone who loves musicals, now there is an excellent way for you to give the gift of live theatre – all year round. A DSM gift certificate allows you to provide the special people in your life with an evening of entertainment and a memory to last a lifetime. When the Winter holiday season draws near, think about a DSM Gift Certificate as an excellent stocking stuffer or even a generous gift for employees, bosses, or colleagues. DSM Gift Certificates also make great Anniversary or Valentine’s gifts for that special someone in your life. You can use DSM Gift Certificates to celebrate Birthdays, Graduations, and other milestones in the lives of your family and friends. At Dallas Summer Musicals, we want to help you create an unforgettable experience. Stop by The Box Office and take care of your gift giving needs today with a Dallas Summer Musicals Gift Certificate! DSM Gift Certificates may be purchased in any increment. DSM Gift Certificates are available for purchase at the Box Office, 909 1st Avenue at the Music Hall at Fair Park, or by faxing to the number below. The Box Office will accept all major credit cards including Visa, MasterCard, American Express, and Discover, as well as personal checks. DSM Gift Certificates may be used towards the purchase of any Dallas Summer Musicals Presentation. Gift certificates must be redeemed at the Box Office at the Music Hall at Fair Park.